The MS2 Ion Inject Time is the time in milliseconds that it takes to fill the ion trap. Short Ion Inject Times correspond to high signal levels or low threshold settings. The MS2 Ion Inject Time metric is the median time spent collecting ions for fragment ion spectra. 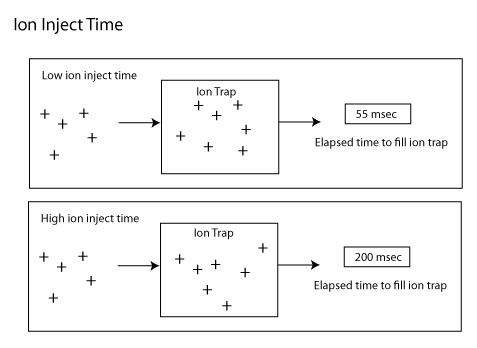 The Ion Inject Time measures how fast ions are being introduced into the ion trap. The ions are injected until either the trap is full, or until a time threshold is reached. If lots of ions are being injected, then the Ion Inject Time will be short. This may be caused by a high amount of sample injected. If only a small amount of sample is being injected, then more than half the precursor ions take more than the threshold time to fill the trap and the Ion Inject Time will be pinned at its maximum value. A gradual drift upward over a period of weeks in the Ion Inject Time may mean that the ion detectors or multipliers need to be examined. The MS2 Ion Inject Time measures the signal strength of the fragment ions. The MS1 Ion Inject Time is analogous for the precursor ions. Different measures of the strength of the fragment ions are the Peaks per Spectrum and the MS2 Signal to Noise.